In Giving I Connect With Others In grieving the death of her daughter, novelist Isabel Allende finds inspiration in the life of service her daughter led and comfort in the love Allende was able to give her in death. 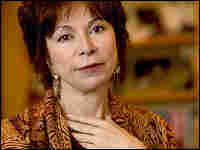 Novelist Isabel Allende was born in Peru and raised in Chile. When her uncle, Chilean President Salvador Allende, was assassinated in 1973, she fled with her husband and children to Venezuela. Allende has written more than a dozen novels, including The House of the Spirits and My Invented Country. Her most recent books include Zorro: A Novel and the final installment in her celebrated children's trilogy, Forest of the Pygmies. The archived Web audio differs from the version that originally broadcast. It correctly identifies Salvador Allende as the president of Chile at the time of his death.